Welcome back to another BEST interview. Today I have the pleasure to be interviewing our team member Elissa of Blue Roof Designs. Hi Elissa! While looking for new potential interviewees I noticed with surprise that you have not been interviewed before. Somehow, maybe because I knew you all the time I was on Etsy, I thought someone who has been here for so long would have been interviewed. Thanks so much for thinking of me! While I've been an Etsy member for over 4 years, I've only recently started listing items and being more active. I think it was on Flickr where we met, actually. Ah yes, I remember that I loved your Flamingo Grabby Journal! Is that a usual, or a rather unusual example of your work? The Grabby Journals come in different colors and this one is part of a series that I offer - each color is named after a bird. Those journals evolved out of my love for texture and weren't really intended for any particular audience. But the majority of my work is geared towards the bridal and baby markets. As people tend to take the most pictures during these times, it makes sense. Most of my photo albums are pretty formal and are a good match for a wedding or anniversary gift. 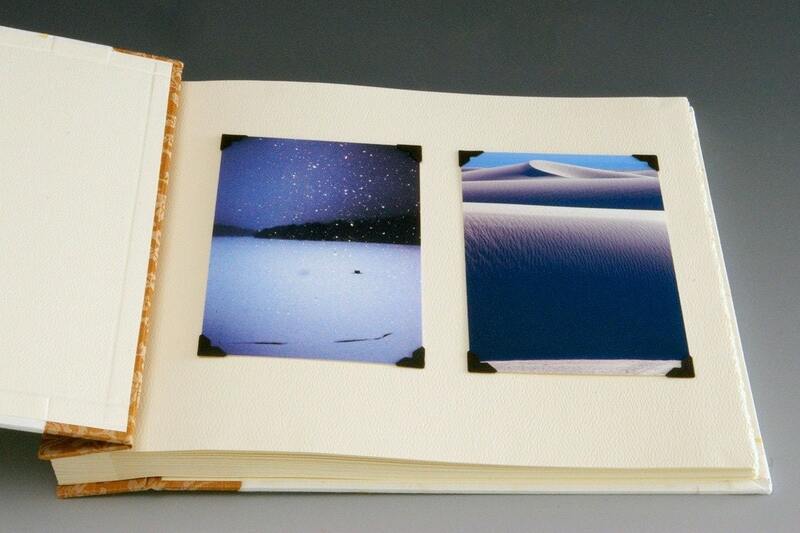 Many grandparents use my accordion books as “brag books” to show off their new grandchildren. I would love to live in a world where people felt comfortable in celebrating everyday life - day trips to the park are just as valuable as bridal showers. I must admit that I am jealous of your business name. Blue Roof Designs sounds immediately comfortable, friendly, and positive to me! How did you come up with it? The first house I owned had a metal roof on it that needed to be repainted. A roof guy came over and showed us some small paint samples and we chose blue for the color. After the roof was painted, we were shocked at just how blue it was – I’m talking serious Smurf blue. When I started selling my work and had consultations in my home studio, I would tell people that they could identify my house by its bright blue roof. I eventually decided to name my business Blue Roof Designs because my house had become such a part of my professional identity. I’m now living in my second house with a blue roof – this time with asphalt shingle. How did bookmaking come to your life? In the early 90’s I went to graduate school for Art Therapy in Cambridge, MA. Every day, I passed by a Paper Source that was located between my apartment and my classes. As soon as I saw the “help wanted” sign in the window, I ran right in. I didn’t know anything about paper or bookbinding until I worked there (they sold more paper back then). Part of my job was to assist with store workshops and that’s when I picked up my basic bookbinding skills. I ending up writing my graduate thesis on using bookbinding in the Expressive Therapies and even bound a few copies. I think that books have stayed with me for so long because I am passionate about the idea of being the facilitator of someone’s story. Do you have another job in addition to making books? 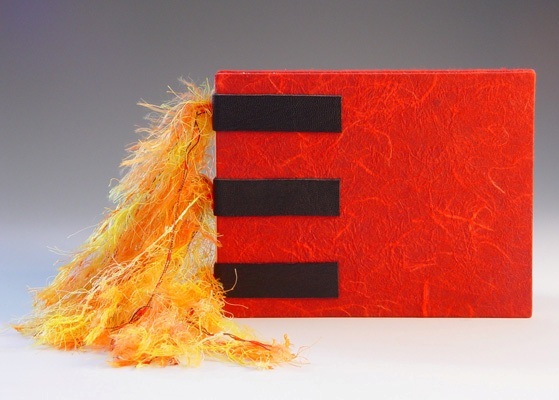 I primarily identify myself as a professional bookbinder, although part-time. For the past few months, I’ve been focused on custom work and teaching workshops, which I love. In the fall, I’ll start production for the holiday season. Aside from my on-the-job training at Paper Source, I try to take at least one book arts class/workshop a year. I’ve been fortunate to take classes with Julie Chen, Hedi Kyle, and Carol Barton. 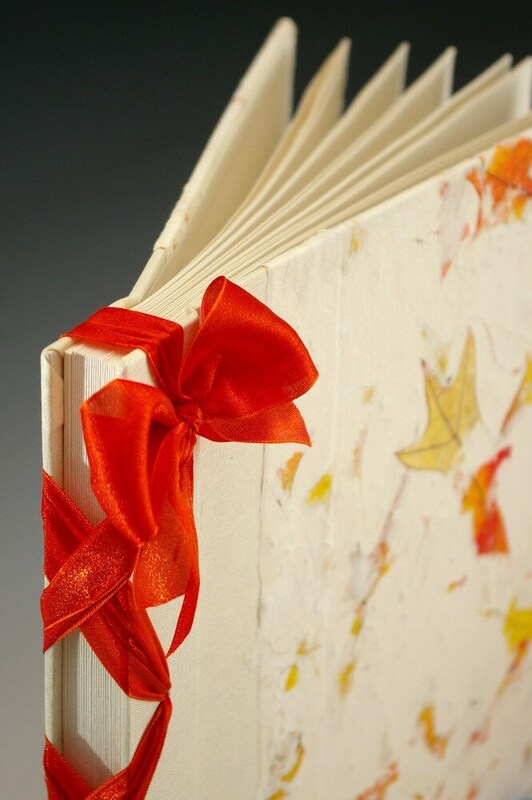 I hope to continue making education a priority – the more I explore the book arts, the more I want to learn. In addition to the creative work, I’m also a computer geek. Lately I have been consulting with people on a variety of technical projects, including Email newsletters, social media marketing, and website maintenance. There seems to be a need for computer assistance with a gentle touch - I think that my training as a therapist has helped me fill this local niche. I fell into this kind of work and haven’t yet sorted out where it will go as a business, but I really enjoy it. Most recently, I worked as the Artist Liaison for the Stowe Street Arts Festival, an annual community arts event in Vermont. I worked with the visual art exhibitors, doing everything from registration to booth layout. Now that the festival has passed, I’m looking forward to spending more time on my own work. Oh, and did I mention my occasional work as a mystery shopper? Yeah, I’m busy. Is there a crafter or bookbinder you especially admire? 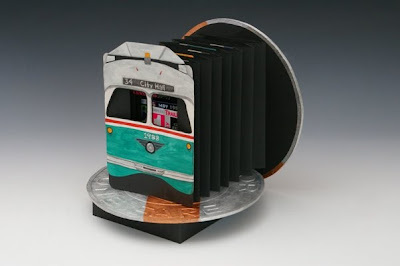 I am beyond in awe of book artist Julie Chen – it’s total fandom. I think I most respect (and envy) her ability to create a full experience with her work. Her ability to integrate form, function, and content is just mind-blowing. I could call her an idol of mine, but she’s really more of a rock stArtist. I took a class with her a few years ago and consider it one of the top ten experiences of my life. Am I gushing enough? Is there a book that you made, that is special to you? My favorite book is “Philadelphia Freedom” and I’ll never ever sell it – that one’s for me. A few years ago, I discovered my collection of SEPTA passes (dating back to 1992) while going through an old box (SEPTA is the public transportation system in Philadelphia). I’ve always believed that one of the major steps I took in becoming an adult was mastering SEPTA when I was in college. I gained a strong sense of independence as I negotiated the different subway and trolley lines. I was thrilled that I hadn’t thrown the passes away and felt that they needed a home – a place of honor. The tunnel book format seemed ideal for both housing my passes and preserving the personal journey that I took during my college years. Of all the books I’ve made, I feel that this book best represents who I am as both a person and as an artist. Do you have special plans for your shop and your crafting in the next time? I recently bought some reptile embossed papers while on my summer vacation and I’m planning on using them in a line of monochromatic journals. I hope to have them available for sale on Etsy this fall. Thank you Elissa, for this interview! If you now want to see more Blue Roof Designs books, there is for course the Etsy Shop to look at, and there is also a website, where you can see a lot of her works in a beautiful gallery, and stroll on to her blog, or to twitter, facebook, or Flickr. Fantastic stuff! I LOVE your train, what an excellent idea! Your reptile paper sounds great too, have fun with that! thank you for wonderful interview! I met you on Flickr also. beautiful books. Great to hear about your business and how you got started. I love your story about the blue roof too! Your books are beautiful and the Philadelphia one is so cool.